Includes Card Port, 70 Designs, 120 Border Frames, 5 Fonts, 10 Styles 1-Step Buttonholes, Auto Threader & Trimmers, Start/Stop, Needle Up Down, Speed Limit Control, 8 Presser Feet. AllBrands is a Brother Authorized Dealer and ASC Authorized Service Center for any repairs including warranty parts, electrical and labor. We give unlimited technical support by email, fax and phone. We service machines in our stores and/or refer to your nearest ASC Brother Authorized Factory Service and Warranty Centers nationwide. Mass merchants do not have tech service or repair departments for your equipment. They are unable to help you directly, only referring any operational, mechanical or electronic questions back to the manufacturer instead of taking care of the problems themselves. Manufacturers and customers should expect that any problems you have will be taken care of by the dealer or merchant who sold you the equipment, not by just referring your questions back to the manufacturer. An inspiration to modish mavens and fashionistas, the LB6770 sewing and embroidery combination machine brings new creative potential to a designer’s palette. With 70 built-in embroidery designs, five monogramming fonts and 120 frame pattern combinations, the LB6770 imparts style and panache to designer creations. Using the 67 built-in stitches, 98 stitch functions and 10 styles of one-step automatic buttonholes, this limited edition machine brings added dimension, color, texture, imagery and sophistication to apparel. 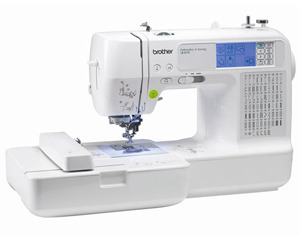 The built-in embroidery card slot allows the use of thousands of optional Brother embroidery designs for greater differentiation tailored to a designer’s unique vision. In the box:	7 extra feet (buttonhole, overcasting, monogramming, zipper, zigzag, blind hem, and button fitting), seam ripper, 4 bobbins including clips, needle set, twin needle, cleaning brush, eyelet punch, screwdriver, touch pen, 3 spool caps, spool pin, spool net, foot controller, scissors, disc-shaped screwdriver, embroidery hoop, accessory case, and manual.